The Color Wizard lets you submit your own base color, and it automatically returns matching colors for the one you selected. It returns a set of hue, saturation and tint/shade variations of your color, as well as suggests color schemets to you, based on your color’s complementary color, split complementary colors, analogous colors and other variations. 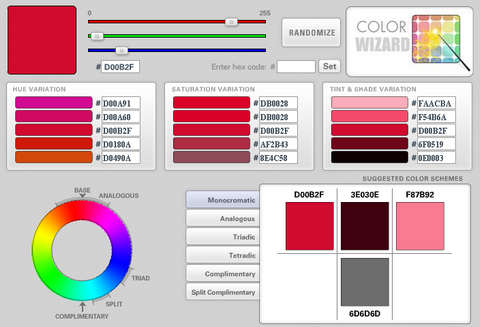 The Color Wizard also has a randomize function that lets you generate color schemes you might not have thought of on your own. The first version of the Color Wizard was completed back in 2000 as an ASP application. With version 3, it has been converted to a flash based application. I’ve been looking for one of those for a while.